After a good win last week against St. David’s, Ruthin were confident for the game against Shrewsbury. Ruthin started well and had number of shots and kept the ball well. Ruthin played with a high press to get more chances earlier on in the game and it worked, with a great ball from Edmond. He found Joe who took the ball down and shot into the top right hand corner to make it 1-0 to Ruthin. Vincent soon after had a shot that only just went wide. As Ruthin began to great more chances, Joe got another goal from outside the box: 2-0. 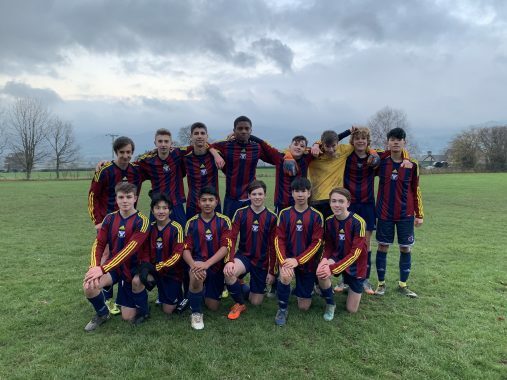 The whole team were showing great confidence and creating numerous chances which followed with Joe getting his hat trick just before half time. The half time team talk was important, that the team carried on staying focused and not to think it was over. As the second half began, Shrewsbury had a number of chances which Ruthin defended well and great saves from Gareth kept it at 3-0. Ruthin started to get tired which gave Shrewsbury some opportunities and so substitutes were made which helped Ruthin. Charlie playing a great shot to Joe for his 4th goal and soon after Javen picking out Joe for his 5th. This was the U16’s best performance of the term so far with the whole team playing very well. MOTM goes to Joe for getting 5 goals!